The DeTemple '56 Spirit Series could very well represent the holy grail of Stratoliciousness. I could stop blogging right here and move to Tibet. Having just discovered DeTemple, and spending time at the website, I'm still trying to gather up my jaw fragments from the floor. Michael DeTemple would seem to be the archetype gourmet Strat builder, as the Rick Turner quote in his website header suggests. Yes, the builder that great builders aspire to. Kinda like Shawn Lane gushing about Allan Holdsworth. You absolutely MUST make a pilgrimage to "De Temple" (stupid pun, ok). Personalized owner's manual with build photos and individualized markings locations photos-- for insurance purposes. And that's just getting started. The wiring, shielding, switches, pots-- even the capacitors are the best available. Every detail receives meticulous attention. DeTemple makes his own Sweetspot model pickups, although he also plugs Fralin, Van Zandt & Lollar as options. Check out the Harmony Central comments. If anything could make a Suhr seem like a Squier, it might be the DeTemple. No disrespect intended to Suhr, it's just that I was floored by the extreme dedication to craftsmanship excellence presented by DeTemple. Beyond good marketing, one really gets the passion and understanding that this guy possesses for the complete ultimate Strat concept. Now, with all that, let me honestly say that I haven't touched or heard a DeTemple instrument-- and I may never get the opportunity. The comment about Suhr is an exaggeration for the purpose of poetic magnitudeness-- I'm a huge Suhr fan. But when you visit DeTemple.com and dig into the info., you'll KNOW you've glimpsed Mecca. DeTemple's are expensive and it can be a long wait to get one. But I've read that Michael and his small staff really communicate well with their customers. This could be the chosen one. So what am I gonna feature next Friday?????? 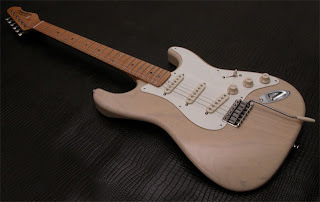 Today's Friday Strat feature is dedicated to Cary over at Electric-Guitar-Review, whose quest for the ultimate Strat has been put on hold as Cary vacations in Hawaii... Poor guy.